WINTERBERG, Germany — Emily Sweeney made her way all the way back from last year’s debilitating crash at the Olympics to win a bronze medal Saturday at the luge World Championships in Winterberg, Germany. It was Sweeney’s first career World Championship podium result, and the 17th World Championship medal in United States team history. The 25-year-old who lives in Lake Placid was also 2013 Junior World Champion. 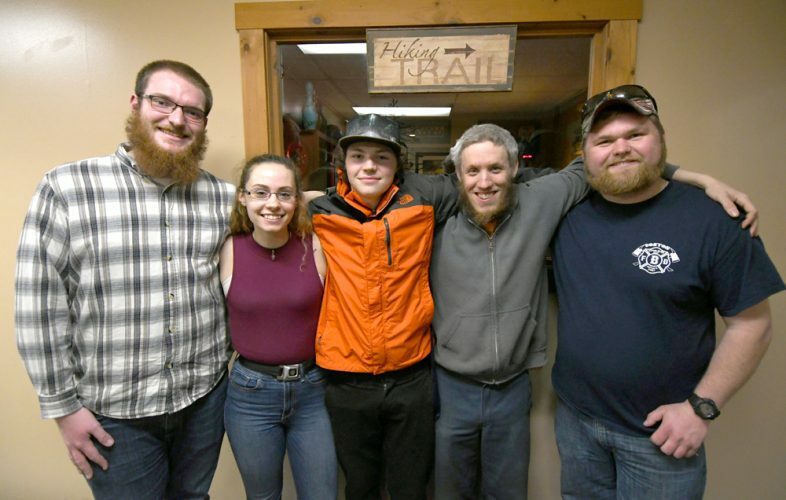 In typical Winterberg fashion, weather was integral to the story. “It kind of threw a little wrench in my mentality going to the track today knowing it was so warm out,” Sweeney said. 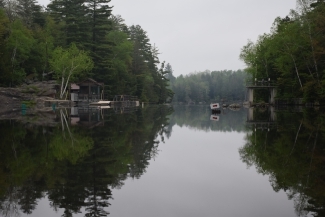 The temperature change came after more than 10 days of nearly ideal winter conditions and fast ice. Sweeney began her season with a World Cup bronze at Whistler, before settling for two World Cup fourth places in Lake Placid and another in Friday’s World Championship sprint race. It looked like more of the same was on tap as Sweeney positioned herself into fourth place after Saturday’s opening heat. The Americans, at the intermission, were on the heels of Germans Natalie Geisenberger and Julia Taubitz, with Summer Britcher third and Sweeney next. But the U.S. world medalist reeled off the second-fastest final heat to grab third place. Britcher, in the next sled, looked like she would overtake her teammate. The two-time Olympian was accelerating in the final heat as indicated by her split times. However, as she neared the end of the Winterberg course, Britcher slipped back and wound up fifth, just 0.05 of a second from the podium. The doubles race saw Chris Mazdzer, of Saranac Lake, and Jayson Terdiman battle through some rain, warm temperatures and high humidity — as well as Mazdzer’s neck ailment that has hampered him since early last week. 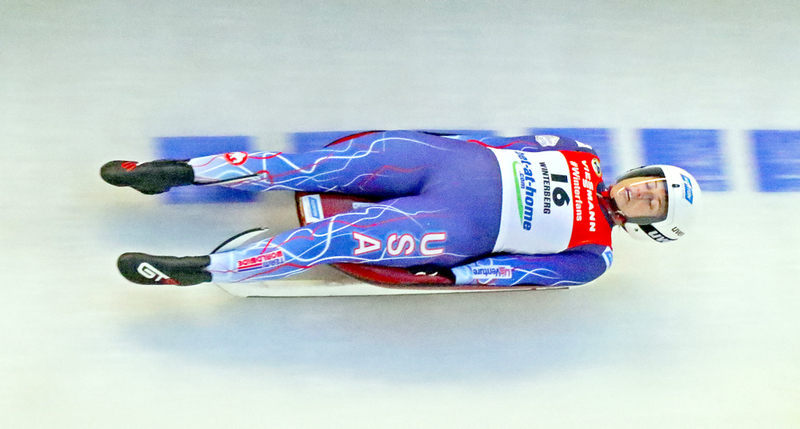 The only U.S. sled in the field finished 11th. Germany took four of six medals on the day, and now have 10 of 15 over the two days of these World Championships. Understanding the alarming nature of her crash in South Korea, Sweeney sees how that mishap continues to be viewed. But instead of trying to change history, she has used it to make herself a better racer. “What happened in Pyeongchang made me mentally stronger, in general,” she reflected. “All the cliches are true: What doesn’t kill you makes you stronger. I’ve had a really challenging year and I think I’m better for it. Saturday afternoon’s race had a familiar ring to it. With the change in Winterberg’s weather, those with early start numbers figured to have an edge. That point was easily seen in training when there were few spectators, but on race day, Sweeney said it was blocked by a spectator. Britcher began the race with bib number one and celebrated as she crossed the finish line after a run that would place her third. Geisenberger and Taubitz were the third and fifth athletes, respectively, down the course. The former has been virtually unbeatable since picking up the 2010 Olympic bronze medal. She’s also a nine-time World Champion. In the midst of those crowns there have been two Olympic gold medals in singles and another two in the team relay. Geisenberger is also unflappable. Despite having to reset her first run due to a technical issue on the track, she could not be iced. She sat on the start handles just seconds from starting her first run when time out was called by race organizers to attend to the matter. Geisenberger retreated to the confines of the start house. When she was called out a few minutes later, nothing had changed. The predominant race favorite, Geisenberger put herself back in race mode and opened a 0.2 of a second gap over Taubitz, with Britcher 0.26 behind, followed by Sweeney, 0.32 off the pace. The race order was reversed for the final heat, with the contenders ending the event. But as the afternoon wore on, the track seemed to hold up for everyone as essentially all 20 finalists posted second leg times that were better than their first. Geisenberger put down the two best runs of the race and clocked 1 minute, 53.868 seconds. Taubitz, who claimed the U23 World Championship, struggled to begin her second heat, but held on for the silver medal in 1:54.293. Sweeney’s second attempt was only bettered by the winner. That effort enabled the American to claim the bronze on one of the longest women’s courses on the international circuit. That trait played into Sweeney’s hands as it gave her more track to use her driving skills. Her two runs totaled 1:54.381. The medal now seems quite remote from South Korea. A consistently quick starter, Britcher has become a fan of the Winterberg layout despite its quirky start. To get the run underway, there are two slight changes of direction. The athletes, ideally, try to thread a straight line through that opening section and get their run underway with no excessive turning. Britcher mastered that in both heats and kept gaining valuable fractions thereafter. Somehow, however, the clock determined that there were slight time losses at the end, which dropped her from third to fifth. Russian Tatyana Ivanova raced in between the Americans, in fourth place, thanks to the third fastest final heat. Britcher recorded 1:54.437. The World Championship doubles race was a movie with a familiar ending where Germany takes gold and silver, with Austria in the bronze position. Saturday was no different, although the plot had a second heat twist. Toni Eggert and Sascha Benecken, 2018 Olympic bronze medalists, spotted teammates Tobias Wendl and Tobias Arlt the first run lead by 0.04 of a second, before blasting right by them with the fastest final heat to take the world title. It was their second gold medal in 24 hours after Friday’s win in the doubles sprint. Wendl and Arlt, double Olympic champions, took the silver medal with Austrians Thomas Steu and Lorenz Koller picking up the bronze. The results mirrored the sprint race. Eggert and Benecken clocked 1:27.256; Wendl and Arlt were 0.07 of a second from the winners; Steu and Koller were another 0.07 from second place. A pair of Latvian teams were fourth and fifth. 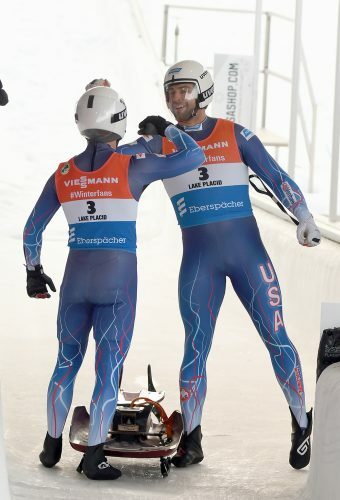 Mazdzer and Terdiman, after placing fifth in the sprint event, were 11th as Mazdzer continued to push through a severe neck strain incurred here at the start of international training week. The condition nearly sent him home, according to his post on social media. They mustered a final time of 1:27.720.